DLC Adult Literacy Community | Empowerment through literacy! The first short video provides some insight into current research on neural pathways in individuals affected by dyslexia. The second video focuses on brain mapping and promising findings about the effects of multi-sensory phonics-based instruction on neural pathways. MRI studies show that the type of instruction we provide using Orton-Gillingham methods and Wilson materials can create new pathways in the brain and activate the left posterior sections of the brain responsible for rapid decoding and automatic word recognition. It takes time and patience, but most of our students show improvement within a few months, and nearly all show improvement within a year. Perhaps most crucial for adult learners is the realization that they can learn how to read. That moment of realization changes lives. The Irlen Institute describes some of the symptoms of Irlen Syndrome: “Some individuals experience physical symptoms and feel tired, sleepy, dizzy, anxious, or irritable. Others experience headaches, mood changes, restlessness or have difficulty staying focused, especially with bright or fluorescent lights.” Specific reading problems include misreading words, problems tracking from line to line, skipping words or lines, hesitating frequently, and/or miscomprehending texts. I didn’t have any colored overlays handy, but I did have some blue index cards. When the student placed a card below a line of text, she was able to read it without a problem. Her symptoms disappeared completely within 10 minutes. Given the high proportion of Forsyth Tech students who tested positive for Irlen Syndrome, it seems likely that many of our students might suffer from it as well. It’s worth checking to see if a colored index card or a colored overlay make a difference for your student. We’ll soon be stocking both in the library at Lakewood. Please let us know if you find them useful. 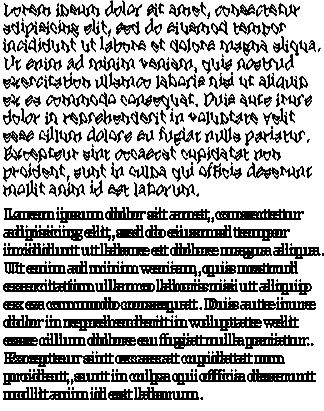 The image of ‘dancing text’ (see above) was found here on wikipedia. Thanks to our fabulous tutors, we have a number of new resources in the Adult Literacy Library! Betsy and Bonnie each contributed a number of fabulous worksheets to the Homework Sharing Binder located under the Wilson materials. (The index at the front of the binder does not yet reflect these additions, so make sure to flip through the binder to see what’s new.) Also – Betsy writes about her contributions in the previous blog post, so check that out, too! Karen recently donated more than 20 books, including Elijah of Buxton; Bud, Not Buddy; Fantastic Mr. Fox; Stone Fox; Rosa Parks; The Brown Condor: The True Adventures of John C. Robinson; Jackie Robinson; Spacebusters: The Race to the Moon; Eruption! The Story of Volcanoes; Journey of a Humpback Whale; Tiger Tales and Big Cat Stories; Growl! A Book about Bears; Fluffy Goes Apple Picking; The Secret of Foghory Island; Horse Heroes; Earthquakes and other natural disasters; Shark Attack! ; and others that are still on their way. Wow! Sarah (Bell) recently donated copies of Wilson Student Workbooks (A & B) for Steps 1-6. We are keeping them in our office in case the library copies are not available when a tutor needs to make some copies. Just see a staff member if you need to grab one to make some quick copies. Great (and generous) idea, Sarah! Pushti – AC Member and Volunteer – has just created two huge binders of resources from the Florida Center for Reading Research. The worksheets and games cover all aspects of reading – alphabetics (phonemic awareness, phonics, and sight word recognition), fluency, vocabulary, and comprehension. The resources are organized by reading component and level. Fortunately, there are a number of great worksheets and games perfectly suited to supplement our Wilson and Megawords materials. While they were created for primary and secondary school students, most will work just as well for adults. One of our partner nonprofits, the Augustine Project, shared a number of phonics games that can be used to supplement our Wilson materials. They are located in the file box on the library book check-out table (under the window). We will be adding more games as we find/create them. We will continue to add new items to our library, so keep checking the shelves and this blog for updates. And if you know someone itching to make a book donation, please send them the link to our online wishlist, which contains a growing list of desired books (with links to publisher sites). I am tutoring a wonderful student named Rufus who is at Wilson Level 1.2A, and wanted to let you other tutors know that I recently put some things in the Homework Sharing Notebook (in the Library) that I’ve worked on with Rufus. The first thing is a lot of sentences I’ve come up with for reading and dictation. I’ve found the ones in the Wilson books great, but needed more, so I’ve written some, and thought I’d share them. Sight words are in red and vocabulary words are in black. I also got an idea for homework from the notebook of scrambling sentences and letting Rufus try to unscramble them (thanks, Rebecca!) Well, he loved doing this and asked for more of those. So I wrote out more of those and put those in the notebook, too. I think if we all take a few minutes now and then to run off a copy of some of the more successful homework sheets we’ve come up with, we could save each other some time. There are lots of good ideas in that notebook! I’m Kinesthetic-Visual. That means I need to interact with people and things to learn and that I need to see information in diagrams or charts to be able to process it. I have learned that about myself after 31 years of life and years of schooling- and it was just reinforced and validated after I took this VARK cool quiz (link below). I would highly recommend this quiz for tutors as a good resource. 1- Take the quiz yourself. Find out your learning styles. The results page explains INPUT, STUDY TECHNIQUES and OUTPUT. 2. Try the quiz with your student. You most probably need to read the quiz and their results to your student. * Based on library checkouts; the use of books during lessons; and feedback from students.